“How do we see healthy disciples of Jesus multiplied in our day? We want to see churches planted that are reproducing churches, creating a multiply movement, and we want to partner together as the body of Christ. The prayer of John 17: ‘Lord, I pray they would be one, as you and I are one, so that the world may know.'” . . .
Gord Fleming is encouraging church planters, pastors and others to take part in Multiply Conference 2019 February 6 – 7 at Westside Church in downtown Vancouver. Fleming, now executive vice president of Multiply (until this month C2C Network), worked in the marketplace before taking on leadership of the movement in 2006. Each year at the Multiply Conference, we gather leaders to be inspired, equipped and encouraged under the teaching of practitioners who are being used by God to bring renewal and missional reproduction to their churches. We look forward to what God is going to do among us during these days together and to the fruit that will follow in local churches as a result. Every generation is subject to spiritual and theological “drift.” Christ-centred lives and ministries are non-negotiable as we pray into national awakening. Methods and models will change with the times and the culture, but the Gospel of Jesus remains the unshifting message of hope for every generation. “Unless the LORD builds the house, they labour in vain.” Without the Holy Spirit’s empowering and enabling, all our human efforts will be for naught and so we cry out for the presence and power of the Holy Spirit to move locally, nationally and globally. Jesus promised that the gates of hell would not stand against the advance of His kingdom. We confidently step into the victory of Jesus’ finished work, declaring Him as King, calling lost people to salvation, and those “found” to lives of radical discipleship and service. Jesus’ mission is our mission! Go here to see the main stage and breakout speakers, many of whom are local, including Bill Hogg, Mark Clark, Norm Funk, Jeff Bucknam, Alastair Sterne, Brett Landry, Stephen Mulder and Joseph Peterson. 1. Am I a Church Planter? 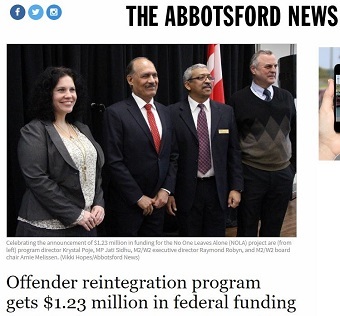 The federal government today announced $1.23 million in funding for an Abbotsford-based project that helps newly released offenders reintegrate into the Fraser Valley. MP Jati Sidhu (Mission-Matsqui-Fraser Canyon) said the No One Leaves Alone (NOLA) Reintegration Project, run by M2/W2 Association Restorative Christian Ministries, is expected to help 35 to 40 men and women ages 18 to 55 to make the transition from prison to living in their communities. The individuals will be assisted with things such as finding suitable housing and stable employment; getting help for addiction or mental illnesses; and accessing education and skills training. The project, which began its work in 2018 and is supported by volunteers, will serve Abbotsford, Mission, Chilliwack and Langley. . . .
NOLA program director Krystal Poje said a 2014 Correctional Service of Canada (CSC) study indicated that 80 per cent of men and 70 per cent of women leaving jail will eventually return. “Generally, these individuals do not have a healthy support system (or) the needs and/or skills needed for successful reintegration; thus, the prison gates become revolving doors,” she said. Thomas Aquinas is a saint in the Catholic Church, but his influence as a philosopher, scholar, theologian and preacher reaches far beyond church walls. This Saturday (January 26), St. Mary’s Catholic Church in east Vancouver will host the St. Thomas Aquinas Festival. He’s considered a brilliant philosopher, a human encyclopedia, a bulwark of orthodoxy – and completely unpalatable to the average Catholic. 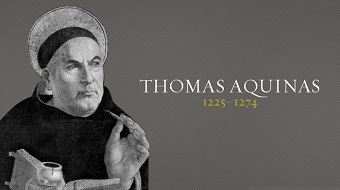 “When you think about St. Thomas Aquinas, you think about someone who only experts, academics and theologians know. That is true. St. Aquinas uses a scholastic jargon we are unfamiliar with,” said Father Gabriel de Chadaravian, OP. St. Thomas is best known as a clever philosopher and author of the hefty Summa Theologica, but Father de Chadaravian said the saint was more a humble theologian at heart. Go here for the full article. For another good overview of Aquinas’s life, go to this Christian History article. The event will run from 9:30 am – 4 pm, though the bulk of the programming – speeches, skits and a performance of one of his hymns – will be between 11 am and 3 pm.